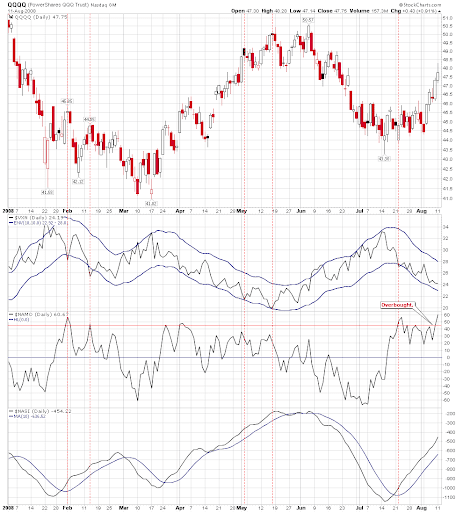 Besides the extremely overbought NAMO on 1.1.B QQQQ and VXN, there is no special signal today and thus it is unclear if the market will go up or down. The previous analysis on the climax run still holds, i.e., if the market rallies during the next two days people who have no short positions would better lock some profit, and I will watch if there is any market topping signals. If you don't have many long positions to date and no fast hand, do not open long positions now. The reason is: if the rally is healthy the market will pull back at some point; if it is the final climax run, you probably will buy at the peak price if you open long positions at this point. Whether one should short QQQQ based on overbought NAMO, well, besides NAMO there is no other signal to support the short. NAMO is simply the difference between EMA(13) and EMA(39) on NAAD, and no rule says how high a reading is considered as overbought. As such shorting QQQQ may be against the trend, slow hands should definitely stay away. 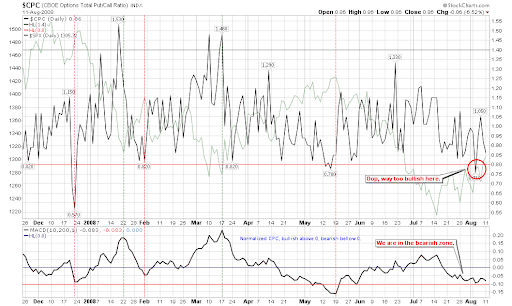 Tomorrow you may keep any eye on 2.8.1 CBOE Options Total Put/Call Ratio, where CPC is a bit low at 0.86. If fast hands find it declines further down below 0.8, it can be considered to trade against the trend. Again, remember the market may go up for six consecutive days during the Climax Run, so consider the risk. 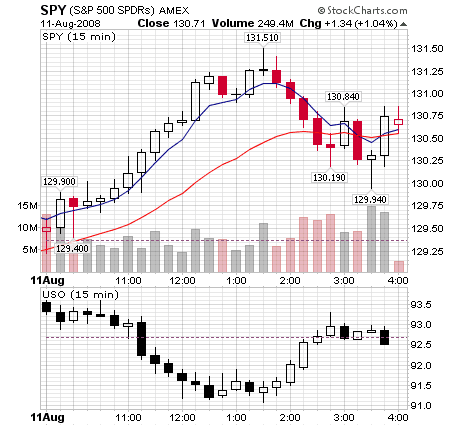 Another chart 0.0.1 Simple SPY Trading System, if the rally continues tomorrow and the volume is smaller than today at the market is closing, in other words if price up volume down for three days, the probability of seeing a pullback is high. Again, the pullback may last one day only. Slow hands do not do it. 1.1.2 Nasdaq Composite (Weekly) is testing the up channel, keep an eye on it tomorrow. 1.3.1 Russell 2000 iShares (IWM Weekly), the up channel is broken. 1.3.0 Russell 2000 iShares (IWM Daily), IWM has almost claimed back all its loss. How bullish it is! 1.1.4 Semiconductor Holders (SMH Daily). It seems a Double Bottom. 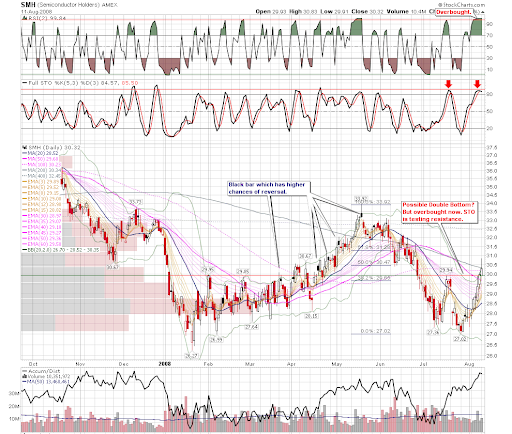 However it is overbought and the STO indicator is testing the resistance. 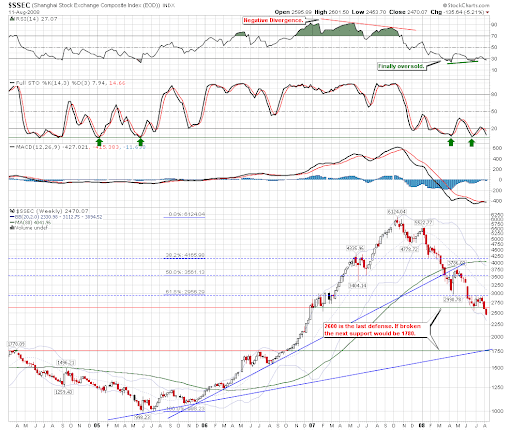 1.5.1 Shanghai Stock Exchange Composite Index (Weekly), the last fence of the China stock market is broken. There is no any support until 1780. Not good! 3.1.0 US Dollar Index (Daily). The chart of US dollar may not be entirely right. It is overbought though. 3.3.0 streetTRACKS Gold Trust Shares (GLD Daily). GLD is miserable. 3.4.2 United States Oil Fund, LP (USO Weekly), the support on Oil is broken too. How the trends of three above stuff develop, I have no idea at the moment. Let's watch for a few more days. Take notice that the various markets are highly correlated in these days, and both currency and commodity do matter to the stock market. The following chart shows the pullback of today's market, and you can see the strong correlation between the oil and the stocks. Actually the impact of oil price movement on the stock market fluctuation has lasted for some time. I have two open questions to readers: how long will the US dollar keep bullish? How low can the oil price decline? 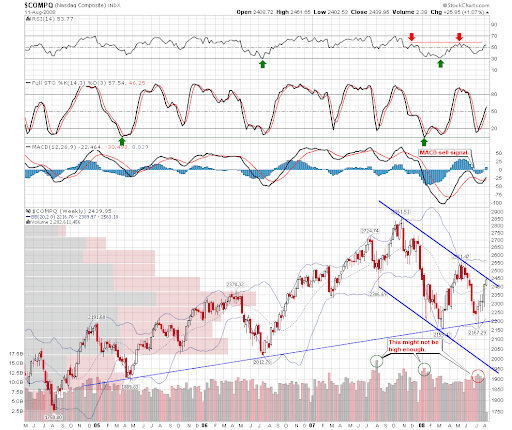 2 Comments on "08/11/2008 Market Recap: NAMO Overbought"